The image below illustrates a herniated nucleus pulposus at multiple levels, one of the causes of low back pain. Uncomplicated acute low back pain and/or radiculopathy are benign, self-limited conditions that do not warrant any imaging studies. MRI of the lumbar spine should be considered for those patients presenting with red flags raising suspicion for a serious underlying condition, such as cauda equine syndrome, malignancy, or infection. In patients with a history of low-velocity trauma, osteoporosis, or chronic steroid use, initial evaluation with radiographs is recommended. In the absence of red flags, first-line treatment for chronic low back pain remains conservative therapy with both pharmacologic and nonpharmacologic (eg, exercise, remaining active) therapy. If there are persistent or progressive symptoms during or following 6 weeks of conservative management and the patient is a surgery or intervention candidate or diagnostic uncertainty remains, MRI of the lumbar spine has become the initial imaging modality of choice in evaluating complicated low back pain. MRI is the imaging procedure of choice in patients suspected of cord compression or spinal cord injury. Patients with recurrent low back pain and history of prior surgical intervention should be evaluated with contrast-enhanced MRI. Many causes of mechanical low back pain exist. The most common causes are age-related degenerative disc and facet processes and muscle- or ligament-related injuries. Discussion in this article is limited to musculoskeletal causes. These can be divided into nerve root syndromes, musculoskeletal pain syndromes, and skeletal causes. 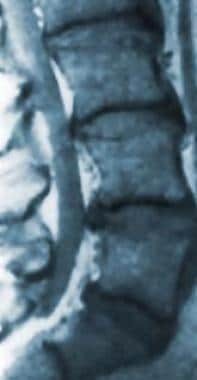 Classic nerve root syndrome is characterized by radicular pain arising from nerve root impingement due to herniated discs. A similar syndrome can also be produced by inflammation and irritation, which may explain why patients whose presentation is consistent with this diagnosis respond to conservative therapies. The cause of impingement syndrome is most commonly herniated discs, but it may also be caused by spinal stenosis, spinal degeneration, or cauda equina syndrome. Fibromyalgia results in pain and tenderness on palpation of 11 of 18 trigger points, one of which is the low back area, as classified by the American College of Rheumatology. Generalized stiffness, fatigue, and muscle ache are reported. Other skeletal causes of low back pain include osteomyelitis, sacroiliitis, and malignancy. Osteomyelitis results from infectious processes involving the bones of the spine, while sacroiliitis results from inflammatory changes in the sacroiliac joints. This pain presents over the sacroiliac joints and radiates to the anterior and posterior thighs. This pain is usually worse at night and is exacerbated by prolonged sitting or standing. Most etiologies of mechanical low back pain are not life threatening; however, significant morbidity is associated with chronic low back pain syndromes. A significant number of patients are unable to return to their normal daily routines or function in a productive work environment secondary to low back pain. Most cases of back pain treated in the emergency department are not true emergencies, with the exception of cauda equina syndrome. Patients who have cauda equina syndrome must undergo surgical decompression as soon as possible or face permanent neurologic damage. The prognosis is good for most patients who present with mechanical back pain. [16, 17] Overall, 70% of patients feel better in 1 week; 80%, in 2 weeks; and 90%, in 1 month. Only 10% of all patients with low back pain have long-term problems. A significant functional overlay or component of secondary gain is present in a subgroup of patients, who also account for the majority of office visits with low back pain complaints (see Causes section). Recurrence is common and seen in up to 40% of patients within 6 months. Prevention methods should be discussed with patients with low back pain along with encouragement to monitor them when the acute period has resolved. Psychosocial factors such as presence of posttraumatic stress disorder, use of a lawyer, presence of other chronic illnesses, and lower education levels appear to be positive predictors of development of chronic back pain in patients who sustain an initial injury to their back. Chronic back pain development was not associated with age, gender, occupation, or severity of original injury. Back belts, which are commonly worn in occupations with heavy lifting, have not been proven to prevent back injury. For patient education resources, see the Bone Health Center; Back, Ribs, Neck, and Head Center; and Muscle Disorders Center, as well as Back Pain, Chronic Pain, and Sciatica. Kinkade S. Evaluation and treatment of acute low back pain. Am Fam Physician. Apr 15, 2007. 74(8):1181-8. [Medline]. Freburger JK, Holmes GM, Agans RP, Jackman AM, Darter JD, Wallace AS, et al. The rising prevalence of chronic low back pain. Arch Intern Med. 2009 Feb 9. 169 (3):251-8. [Medline]. Atlas SJ, Chang Y, Kammann E, Keller RB, Deyo RA, Singer DE. Long-term disability and return to work among patients who have a herniated lumbar disc: the effect of disability compensation. J Bone Joint Surg Am. 2000 Jan. 82(1):4-15. [Medline]. Shiri R, Karppinen J, Leino-Arjas P, Solovieva S, Viikari-Juntura E. The association between smoking and low back pain: a meta-analysis. Am J Med. 2010 Jan. 123(1):87.e7-35. [Medline]. [Guideline] Patel ND, Broderick DF, Burns J, et al. ACR Appropriateness Criteria Low Back Pain. Reston Virginia: American College of Radiology; 2015. [Full Text]. Boden SD, Davis DO, Dina TS, Patronas NJ, Wiesel SW. Abnormal magnetic-resonance scans of the lumbar spine in asymptomatic subjects. A prospective investigation. J Bone Joint Surg Am. 1990 Mar. 72(3):403-8. [Medline]. Hadjipaviou AG, Tzermiadianos MN, Bogduk N, Zindrick MR. The pathophysiology of disc degeneration: a critical review. J Bone Joint Surg Br. Oct 2008. 90(10):1261-70. [Medline]. van Tulder M, Koes B. Low back pain and sciatica (chronic). Clin Evid. 2003 Dec. (10):1359-76. [Medline]. Deyo RA, Weinstein JN. Low back pain. N Engl J Med. 2001 Feb 1. 344(5):363-70. [Medline]. Borenstein D. Epidemiology, etiology, diagnostic evaluation, and treatment of low back pain. Curr Opin Rheumatol. 1996 Mar. 8(2):124-9. [Medline]. Downie A, Williams CM, Henschke N, et al. Red flags to screen for malignancy and fracture in patients with low back pain: systematic review. BMJ. 2013 Dec 11. 347:f7095. [Medline]. [Full Text]. Hoy D, Bain C, Williams G, et al. A systematic review of the global prevalence of low back pain. Arthritis Rheum. 2012 Jun. 64(6):2028-37. [Medline]. Drazin D, Nuño M, Patil CG, Yan K, Liu JC, Acosta FL Jr. Emergency room resource utilization by patients with low-back pain. J Neurosurg Spine. 2016 Jan 29. 1-8. [Medline]. Coste J, Delecoeuillerie G, Cohen de Lara A, Le Parc JM, Paolaggi JB. Clinical course and prognostic factors in acute low back pain: an inception cohort study in primary care practice. BMJ. 1994 Feb 26. 308(6928):577-80. [Medline]. Croft PR, Macfarlane GJ, Papageorgiou AC, Thomas E, Silman AJ. Outcome of low back pain in general practice: a prospective study. BMJ. 1998 May 2. 316(7141):1356-9. [Medline]. Chou R, Shekelle P. Will this patient develop persistent disabling low back pain?. JAMA. 2010 Apr 7. 303(13):1295-302. [Medline]. Williams CM, Henschke N, Maher CG, et al. Red flags to screen for vertebral fracture in patients presenting with low-back pain. Cochrane Database Syst Rev. 2013 Jan 31. 1:CD008643. [Medline]. Marriott A, Newman NM, Gracovetsky SA, Richards MP, Asselin S. Improving the evaluation of benign low back pain. Spine. 1999 May 15. 24(10):952-60. [Medline]. van der Windt DA, Simons E, Riphagen II, et al. Physical examination for lumbar radiculopathy due to disc herniation in patients with low-back pain. Cochrane Database Syst Rev. 2010 Feb 17. 2:CD007431. [Medline]. Frank AO, De Souza LH, McAuley JH, Sharma V, Main CJ. A cross-sectional survey of the clinical and psychological features of low back pain and consequent work handicap: use of the Quebec Task Force classification. Int J Clin Pract. 2000 Dec. 54(10):639-44. [Medline]. de Schepper EI, Damen J, van Meurs JB, et al. The association between lumbar disc degeneration and low back pain: the influence of age, gender, and individual radiographic features. Spine (Phila Pa 1976). 2010 Mar 1. 35(5):531-6. [Medline]. Lurie JD. What diagnostic tests are useful for low back pain?. Best Pract Res Clin Rheumatol. Aug 2005. 19(4):557-75. [Medline]. Kuritzky L. Current management of acute musculoskeletal pain in the ambulatory care setting. Am J Ther. Nov-Dec 2008. Suppl 10:S7-11. [Medline]. van Tulder MW, Koes BW, Bouter LM. Conservative treatment of acute and chronic nonspecific low back pain. A systematic review of randomized controlled trials of the most common interventions. Spine. 1997 Sep 15. 22(18):2128-56. [Medline]. Cherkin D, Sherman KJ. Conceptualization and evaluation of an optimal healing environment for chronic low-back pain in primary care. J Altern Complement Med. 2004. 10 Suppl 1:S171-8. [Medline]. Ballantyne, JC. Avoiding Opioid Analgestics for Treatment of Chronic Low Back Pain. JAMA. June 14 2016. 315(22):2459-2460. [Medline]. Nelson L, Aspegren D, Bova C. The use of epidural steroid injection and manipulation on patients with chronic low back pain. J Manipulative Physiol Ther. 1997 May. 20(4):263-6. [Medline]. Chaparro LE, Furlan AD, Deshpande A, Mailis-Gagnon A, Atlas S, Turk DC. Opioids compared to placebo or other treatments for chronic low-back pain. Cochrane Database Syst Rev. 2013 Aug 27. 8:CD004959. [Medline]. Moffett JK, Torgerson D, Bell-Syer S, et al. Randomised controlled trial of exercise for low back pain: clinical outcomes, costs, and preferences. BMJ. 1999 Jul 31. 319(7205):279-83. [Medline]. [Guideline] Chou R, Loeser JD, Owens DK, Rosenquist RW, Atlas SJ, Baisden J. Interventional therapies, surgery, and interdisciplinary rehabilitation for low back pain: an evidence-based clinical practice guideline from the American Pain Society. Spine. 2009 May 1. 34(10):1066-77. [Medline]. Rubinstein SM, van Middelkoop M, Assendelft WJ, de Boer MR, van Tulder MW. Spinal manipulative therapy for chronic low-back pain. Cochrane Database Syst Rev. 2011 Feb 16. 2:CD008112. [Medline]. Hodges P, van den Hoorn W, Dawson A, Cholewicki J. Changes in the mechanical properties of the trunk in low back pain may be associated with recurrence. J Biomech. Jan 5, 2009. 42(1):61-6. Lotz JC. The biomechanics of prevention and treatment for low back pain: 2nd international workshop. Clin Biomech (Bristol, Avon). 1999 Mar. 14(3):220-3. [Medline]. FDA News Release. FDA clears Cymbalta to treat chronic musculoskeletal pain. November 4, 2010. Available at http://www.fda.gov/NewsEvents/Newsroom/PressAnnouncements/ucm232708.htm. Accessed: November 5, 2010. Kaspiris A, Grivas TB, Zafiropoulou C, Vasiliadis E, Tsadira O. Nonspecific low back pain during childhood: a retrospective epidemiological study of risk factors. J Clin Rheumatol. 2010 Mar. 16(2):55-60. [Medline]. Harris IA, Young JM, Rae H, Jalaludin BB, Solomon MJ. Factors associated with back pain after physical injury: a survey of consecutive major trauma patients. Spine. 2007 Jun 15. 32(14):1561-5. [Medline]. Panjabi MM. Clinical spinal instability and low back pain. J Electromyogr Kinesiol. 2003 Aug. 13(4):371-9. [Medline]. Spector LR, Madigan L, Rhyne A, Darden B 2nd, Kim D. Cauda equina syndrome. J Am Acad Orthop Surg. Aug 2008. 16(8):471-9. [Medline]. Tauney PJW, Siegel CB, LaBan MM. Thoracic and lumbar pain syndromes. Tintinalli, et al, eds. Emergency Medicine: A Comprehensive Study Guide. 4th ed. 2000. 1866-1873.
van Poppel MN, Hooftman WE, Koes BW. An update of a systematic review of controlled clinical trials on the primary prevention of back pain at the workplace. Occup Med (Lond). 2004 Aug. 54(5):345-52. [Medline]. Walsh MJ. Evaluation of orthopedic testing of the low back for nonspecific lower back pain. J Manipulative Physiol Ther. 1998 May. 21(4):232-6. [Medline].